Shrouded in legend, the jagged peaks of Seneca Rocks dominate a remote valley in Pendleton County, West Virginia, near the confluence of Seneca Creek and the North Fork of the South Branch of the Potomac River. Pointed crags soar above the green valley floor and the sparkling river waters. 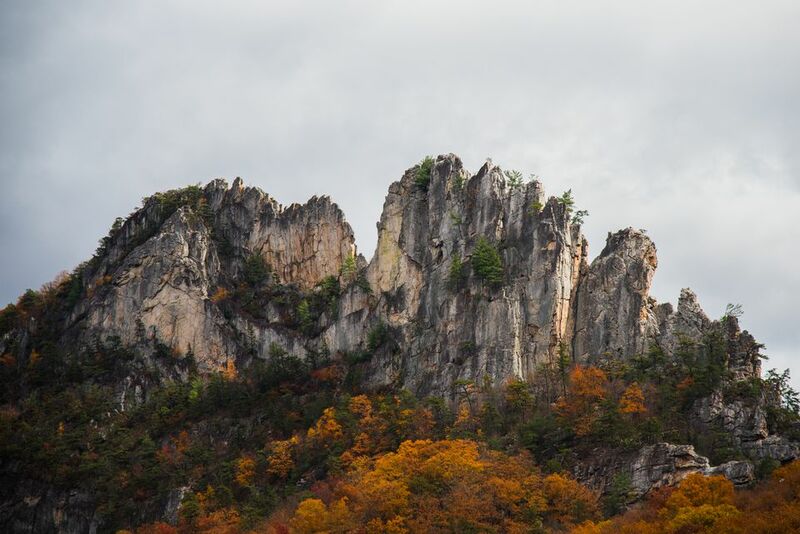 With over 375 climbing routes, a modern Discovery Center and hiking trails, it's no wonder that Seneca Rocks is one of West Virginia's best-known, most popular destinations. Seneca Rocks is only reachable by car or tour bus. From I-81, take the highway to US 33 West. Follow US 33 through Franklin and Judy Gap. Continue north on US 33 / West Virginia 28 through Riverton and past the US 33 turnoff. The Seneca Rocks Discovery Center is just past the turnoff. From I-64, travel north on West Virginia Route 220 to US 33 in Franklin. Head west on US 33 and continue as above. From I-79, take US 33 east to Elkins. Continue on US 33 / West Virginia 55 east to West Virginia Route 28 / 55 north. Turn left onto Route 28 / 55; proceed to the Seneca Rocks Discovery Center. You can hike the trails free of charge. Climbing is also free, but climbers must be aware that the Rocks can be dangerous, even for experienced climbers. Admission to the Discovery Center is free. The Discovery Center is open from early summer to Labor Day from 9:00 a.m. to 4:30 p.m. daily; after Labor Day, the Discover Center is open Fridays, Saturdays and Sundays through the end of October. Seneca Rocks is an ancient formation of Tuscarora sandstone that juts up 900 feet from the North Fork Valley floor. The peaks, reminiscent of Alpine rock formations, attract climbers, geologists and outdoor enthusiasts from all over the world. If you prefer hiking to climbing, you can still ascend the Rocks. A 1.3 mile trail begins behind the Seneca Rocks Discovery Center and winds up the formation to the top. There are stairs and steep switchbacks, of course, but you'll also find benches to rest on. At the top, you'll be rewarded with a stunning view of the valley – and you'll be able to look down on the wheeling vultures. Bring plenty of water and, if you're a geocacher, your GPS unit; there are at least three caches at the top of the trail as of this writing. Perhaps you prefer learning activities to adventurous hikes. If so, the Seneca Rocks Discovery Center should be your first stop. At the Discovery Center, you can talk with forest rangers about local wildlife and geology or take part in one of the weekend programs, which range from nature talks to craft and folk music demonstrations. You can tour the nearby restored Sites Homestead, the first home built in the area by a European-American settler, on Saturdays during the summer. Picnic sites are available. If you decide to hike to the top of the Rocks, stay on the trail. The quartzite formations can be treacherous. If you have never climbed before, take some lessons from one of the two local climbing schools, Seneca Rocks Mountain Guides or Seneca Rocks Climbing School. Do not attempt a climb beyond your capabilities. Bring water and sunscreen if you plan to spend time outdoors. The Sites Homestead's gardens are open to the public every day during the summer. Be sure to check with the rangers in the Discovery Center for information about special programs. You can buy books and souvenirs inside the Discovery Center. There is no food for sale at the Discovery Center, but you can bring a picnic or buy food in the nearby town of Seneca Rocks. The rangers close the Discovery Center promptly at 4:30 p.m. If you're planning a last-minute "pit stop," be sure you're inside the center by 4:15. Looking for Coasters or Water Slides in West Virginia?